Absurdity. The New Oxford American Dictionary defines it as the quality or state of being wildly unreasonable. 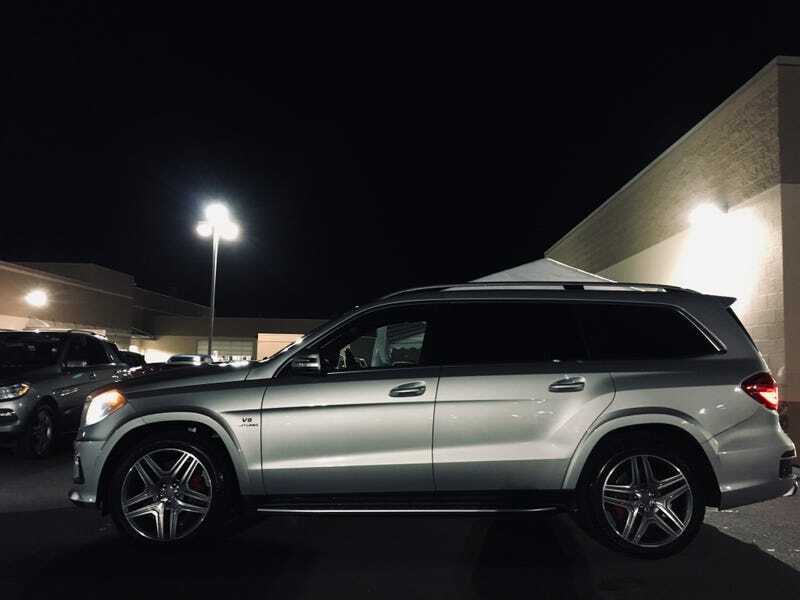 To say that word defines the 2016 Mercedes-Benz GL63 AMG would be harsh, but I believe that is the only word that makes sense in its twin-Turbo V8 context. Now you may be wondering “Surely you jest, DaftRyosuke, the Mercedes GL is not useless at all!” and you’d be correct, it isn’t. For about 15 years now, the GL has been a strong contender in Mercedes’ lineup, taking the world by storm with its large size, ample comfort, and huge amount of space for the budding trust fund family. But this is no standard GL550, this is a whole beast of a different style. This one is completely different...and yet, not different at all. I have driven standard GLs and I’ll tell you, they’re nothing special in any area. They’re very comfortable, the interior is covered with acres of leather and wood, and they’ll get you and your family where you need to go very competently (when they work right). If an Escalade is not ostentatious enough for you, this is what you buy. So, it’s natural that Mercedes would want to inject some sportiness into it (as they do all things) by giving it an AMG branding and a high performance engine. The AMG package, in itself, is rather simple. You take a GL550, rip out its innards, and you replace it with a 577 bhp 5.5L twin-turbocharged engine. The suspension is slightly tweaked, and you stamp some AMG badges here and there. Done. You now have an SUV that once stickered at $92k shoot up to $112k. So, does that 20 grand in extra fees really add up to anything over the base model? Well, from the outside, your first answer might be yes. The package gives the GL a large, snarling front bumper treatment, with large and loud grille openings and a lowered air dam with added front splitter. Aluminum running boards flank the sides, mated to monstrous 21 inch alloy wheels that hide the bodacious bright red brake calipers. It’s not subtle, in fact, “subtlety” is hardly ever in Mercedes’ dictionary. Around back, the grilles continue, with rear faux air ducts to match the front’s. The hidden exhaust of the stock model is replaced with polished aluminum tipped quad pipes that emit a burly, yet handsome noise, not unlike a properly tuned muscle car. The overall package is gaudy, but it works into letting folks know that what you’re piloting is no mere GL350 4Matic. The inside, however, is the greatest upgrade over the standard model for me. I’ve never been a huge fan of Mercedes’ interior material choices on their SUV lineup, but the AMG really brings forth a classic Benz sense of quality and build. Every switch and lever feels solid and with purpose, the leather is supple, yet firm, and there are hardly any creaks and rattles. You could take away those AMG badges that are stamped in the seats, and I’d be hard pressed to guess this wasn’t a Maybach GLS (those are still a thing, right). I suppose if looks and general flexing in the Whole Foods parking lot are your thing, then the GL63 has already made up its $112k price tag, and then some. But some of us around here buy cars based on how they drive, and if you’re one of those, you might just want to put down your checkbooks for just one second. Like most other exciting cars I get to drive, I was pretty stoked when I was handed the keys to this monster of an SUV. But my excitement soon dwindled as I got onto the road and found it to be rather...civilized? Okay, yes, this being an AMG, when you’re in a straight and you stomp on the pedal, it goes. And it goes, and goes, and goes until you get tired of going, and it still has about 30 more miles of “goes” left in it. The 577 bhp is truly doing the lords work here (I can’t even imagine what a Trackhawk is like), but that’s the only real party trick that the AMG brings to the performance department. The rest of the driving experience is kind of mundane, and taking away all of that pomp and circumstances surrounding those three letters, could easily just be mistaken for a well-equipped GL550. Yes, it features a 7-speed AMG semi-automatic transmission, yes it features massive dinnerplate brakes, and yes, it features a super high-tech air suspension that lowers itself at high speeds, but that’s really all just gimmicks in the grand scheme of things. In reality, the GL63 mostly carries itself just like every other GL; it wallows in tight corners, it smooths out bumps, and just feels like your bog standard full-size SUV. Even in SPORT+, I could feel little difference between it and its non-AMG counterpart, leaving me to have to double check that this was indeed a true GL63 and not just a Sport Package model. If you would say that I was disappointed, that would be an understatement. Frankly, I wanted the GL63 to be more than it was. I wanted it to take me by the shoulders and shake me until my brain poured out like soft serve, but I think I got the wrong AMG for that job. If the break neck speeds and the tarted up interior are enough for you, then that’s fine...write your check to your heart’s expense. But for me, I think I might take my business elsewhere. The GL63 talks a lot of talk and it tries to walk, but it just can’t make that final step competently enough.